Misa Nhân Ái Nguyễn, 15 years old and lives in Stockton. 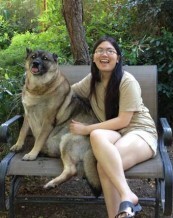 She loves Science, Literature, speaking Vietnamese and visit Vietnam almost every year. Misa also have a dear-little dog names Misu that she love to spend time with. This year (May-2013) she had used her saving to support a water filtration system for Huong Duong Kindergarten, which located in a "cancer village" in Danang, where most of residents are suffering with cancer. "Clean Water in Vietnam - A Project of Viet Dreams"